Leaf Storm Press, 9780997020779, 312pp. 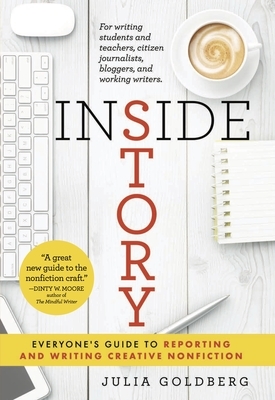 Inside Story tackles the myriad approaches to the burgeoning genre of creative nonfiction--from memoir to criticism to literary journalism to the lyric essay--by deeply exploring each stage of the generation, reportage, writing and editing of stories. Drawing on and integrating examples and advice from diverse practitioners in the field, Inside Story extends beyond idea and inspiration with practical advice, examples and exercises geared toward everyone from writing students, citizen journalists, bloggers and working writers. Inside Story provides a keen focus on the fundamental aspects of reporting, including interviewing and researching, while also offering advice and exercises toward writing nonfiction dialogue, devising structure and creating a sense of people and place from the ground-up. The book also explores the ethical implications of writing in the real world, providing insight and humor at each step of the way. Julia Goldberg has been a professional journalist for more than 20 years, serving as editor of the Santa Fe Reporter from December 2000 through April 2011, during which time the paper won dozens of national awards for investigative reporting, writing, design and web innovation. Julia also previously held the editorial chair for the national Association of Alternative Newsweeklies board of directors, helping to design, coordinate and oversee national journalism workshops and web projects. Her own writing has appeared in numerous regional and national publications, including The Rumpus, Salon, The Huffington Post and Alternet, to name a few. She is a contributing writer and editor to Best Altweekly Writing 2009-2010 (Northwestern University Press). Julia has personally received multiple first-place journalism awards for environmental, feature and investigative reporting, as well as multi-media journalism. Julia is a full-time faculty member in the Creative Writing Department at Santa Fe University of Art and Design in Santa Fe, New Mexico, where she teaches a variety of nonfiction writing courses and is a faculty advisor for the student online magazine. She also is the host of The Julia Goldberg Show, a radio news program that airs on 101.5 FM out of Santa Fe, and the nonfiction editor for the acclaimed literary website, The Nervous Breakdown.